Speedy outfielder made his Major League debut in 2017...Has appeared mainly in center field (432 MiLB G), but has the ability to play right field (61 G) and left field (10 G)...Over the course of his six-year Minor League career, Bautista has collected 233 stolen bases in 281 attempts (83%)...His 233 stolen bases rank fourth in Minor League Baseball since 2012. Began the season with Triple-A Syracuse before being summoned to the Major Leagues on April 29...Recorded first MLB hit, May 6 at PHI...Enjoyed three stints with the Nationals in 2017...Appeared in right field (11 G/4 GS), center field (1 G) and left field (1 G)...Hit .259 with 11 doubles, two triples, 14 RBI, 14 walks, and 30 runs scored in 56 MiLB games...Appeared in 18 games for Gigantes del Cibao of the Dominican Winter League (.174, 3B, 3 RBI, 6 SB). Spent the entire season at Double-A Harrisburg...Set career-highs in nearly every offensive category...Recipient of the third-annual "Bob Boone Award"... Led the Eastern League in hits (153) while his 56 stolen bases tied for the most in Minor League Baseball...Ranked eighth among Nationals farmhands with a .282 batting average...Named Eastern League Player of the Week on Sept. 4...From Aug. 27 to the end of the season, hit .467 (21-for-45), hitting safely in nine of the 10 games....Was cited by Baseball America as being the the "Fastest Baserunner" and having the most speed in the Eastern League...Following the season, hit .250 with two doubles, one triple, eight RBI, seven walks and 12 stolen bases in 40 games for Leones del Escogito of the Dominican Winter League. Hit .275 with 10 doubles, two triples, one homer, 14 RBI, 26 stolen bases and 32 runs scored in 66 games...Ranked tied for eighth in the Carolina League with 23 stolen bases...His 26 SB ranked fourth among Nationals farmhands. In his first full professional season, his 69 stolen bases ranked third in all of Minor League Baseball...Led the South Atlantic League and in runs scored (97). Spent the entire season with the GCL Nationals...Led all qualified Nationals Minor Leaguers and was sixth among Gulf Coast League hitters with a .322 batting average...Also ranked among GCL hitters in runs scored (1st, 44), stolen bases (T1st, 26), hits (2nd, 65), and on-base percentage (7th, .400). In his first professional season, led the Dominican Summer League with 47 stolen bases. April 2, 2019 Fresno Grizzlies placed CF Rafael Bautista on the 7-day injured list. September 28, 2018 Fresno Grizzlies activated CF Rafael Bautista. June 12, 2018 Washington Nationals signed free agent CF Rafael Bautista to a minor league contract. June 12, 2018 Rafael Bautista assigned to Syracuse Chiefs. June 9, 2018 Washington Nationals released CF Rafael Bautista. May 18, 2018 Syracuse Chiefs placed CF Rafael Bautista on the 7-day disabled list. May 7, 2018 Washington Nationals optioned CF Rafael Bautista to Syracuse Chiefs. April 24, 2018 Washington Nationals recalled Rafael Bautista from Syracuse Chiefs. April 12, 2018 CF Rafael Bautista assigned to Syracuse Chiefs from Harrisburg Senators. April 2, 2018 CF Rafael Bautista assigned to Harrisburg Senators from Syracuse Chiefs. March 14, 2018 Washington Nationals optioned CF Rafael Bautista to Syracuse Chiefs. October 14, 2017 OF Rafael Bautista assigned to Gigantes del Cibao. October 13, 2017 Rafael Bautista roster status changed by Washington Nationals. October 6, 2017 Washington Nationals reassigned CF Rafael Bautista to the minor leagues. September 7, 2017 Washington Nationals recalled CF Rafael Bautista from Syracuse Chiefs. August 28, 2017 Washington Nationals optioned CF Rafael Bautista to Syracuse Chiefs. August 27, 2017 Washington Nationals recalled Rafael Bautista from Syracuse Chiefs. August 21, 2017 Syracuse Chiefs activated CF Rafael Bautista from the 7-day disabled list. August 3, 2017 Syracuse Chiefs sent CF Rafael Bautista on a rehab assignment to GCL Nationals. August 1, 2017 CF Rafael Bautista assigned to GCL Nationals. May 24, 2017 Syracuse Chiefs placed CF Rafael Bautista on the 7-day disabled list. May 8, 2017 Washington Nationals optioned CF Rafael Bautista to Syracuse Chiefs. April 29, 2017 Washington Nationals recalled Rafael Bautista from Syracuse Chiefs. March 17, 2017 Washington Nationals optioned CF Rafael Bautista to Syracuse Chiefs. November 18, 2016 Washington Nationals selected the contract of Rafael Bautista from Harrisburg Senators. 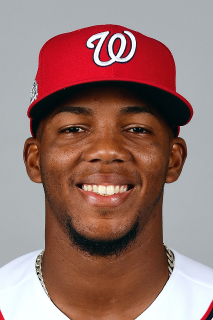 April 5, 2016 CF Rafael Bautista assigned to Harrisburg Senators from Potomac Nationals. March 27, 2016 OF Rafael Bautista assigned to Washington Nationals. October 15, 2015 OF Rafael Bautista assigned to Leones del Escogido. July 22, 2015 Potomac Nationals activated CF Rafael Bautista from the 7-day disabled list. July 12, 2015 Potomac Nationals sent CF Rafael Bautista on a rehab assignment to Auburn Doubledays. July 6, 2015 Potomac Nationals sent OF Rafael Bautista on a rehab assignment to GCL Nationals. April 16, 2015 Potomac Nationals placed CF Rafael Bautista on the 7-day disabled list. April 7, 2015 CF Rafael Bautista assigned to Potomac Nationals from Hagerstown Suns. March 7, 2015 OF Rafael Bautista assigned to Washington Nationals. March 31, 2014 CF Rafael Bautista assigned to Hagerstown Suns from GCL Nationals. March 20, 2014 OF Rafael Bautista assigned to Washington Nationals. June 1, 2013 OF Rafael Bautista assigned to GCL Nationals from DSL Nationals. June 1, 2012 Rafael Bautista assigned to DSL Nationals. January 9, 2012 Washington Nationals signed free agent OF Rafael Bautista to a minor league contract.